At 75 years old, Alfredo Bartolome gets tired just by walking across a big street. He catches the bus often from his home in Waipahu to Hawaii Medical Center West in Ewa -- and then he has to cross four lanes of busy Fort Weaver Road. "The bus stop is too far," Bartolome said. "I usually get too tired and cannot walk too far. That's the only problem I have when I go to the doctor." The bus usually stops in front of most hospitals, but not so at Hawaii Medical Center West. Patients have to sometimes cross Fort Weaver Road or trek across the parking lot, a hazardous and inconvenient path for elderly and physically limited residents. "If the bus went in front of the hospital or had a closer stop, it would be a lot easier," said Mark Tollisen, a 57-year-old Kakaako resident who has a hard time standing still and loses his balance after only a couple of seconds because of a workplace accident. Despite requests from the hospital over the years, the city Department of Transportation Services has said creating a bus stop in front of the entrance isn't possible for logistical reasons. Danelo Canete, head of the hospital previously known as the St. Francis Medical Center-West, said he would be willing to help the city create a new stop, even if that means paying to change the hospital's roads to accommodate the buses. "We have patients coming up to us, crying and asking us for help," Canete said. "We're disappointed because a lot of people who live in the area want to come to our station but cannot because they're too old and their family members work." 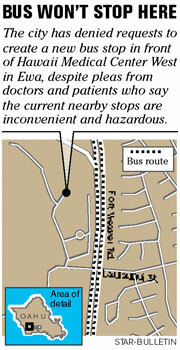 Two bus stops are near the hospital on Fort Weaver Road -- one in each direction. On the mauka-bound side, going toward Kunia, bus riders have to cross the intersection at Fort Weaver Road and Laulaunui Street to get to the hospital. "In contrast to Queen's (Medical Center), Straub Hospital or (Kapiolani Medical Center at) Pali Momi, they're dropped off right at the front door," Canete said. "We don't have that kind of luxury." But Richard Torres, city Transportation Services deputy director, said Hawaii Medical Center is unique because it has an open parking lot, which makes the entrance harder for public access. After several city employees surveyed the area this year, they found that the buses on the current routes are too big to turn into the hospital's grounds, Torres said. To create a new stop, the city would have to make a new bus route, costing a minimum of $1 million, which it cannot afford, Torres said. Jeff Coelho, director of the city Customer Services Department, said the city receives many requests from residents for additional bus stops. However, they aren't always fulfilled because of physical constraints or the need isn't widespread enough to maximize the use. When it comes to establishing new routes, the city usually gauges the community's need through neighborhood boards. Tom Berg, vice chairman of the Ewa Neighborhood Board, said this particular stop hasn't come up for discussion in meetings yet, but bus routes in general are a big concern for residents. "The bus routes to serve the people of Ewa are not only inadequate and insufficient for the hospital," Berg said. 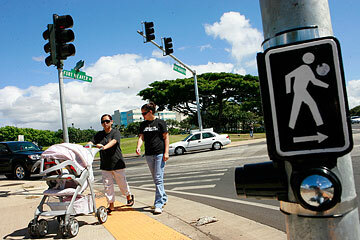 "They are also inadequate and insufficient for many housing communities in Ewa. Most of the buses in the morning and afternoon commute are packed like sardine cans."